Protein citrullination (a.k.a. deimination) is a novel arginine-directed post-translational modification (PTM) that results in a permanent change in the targeted protein. 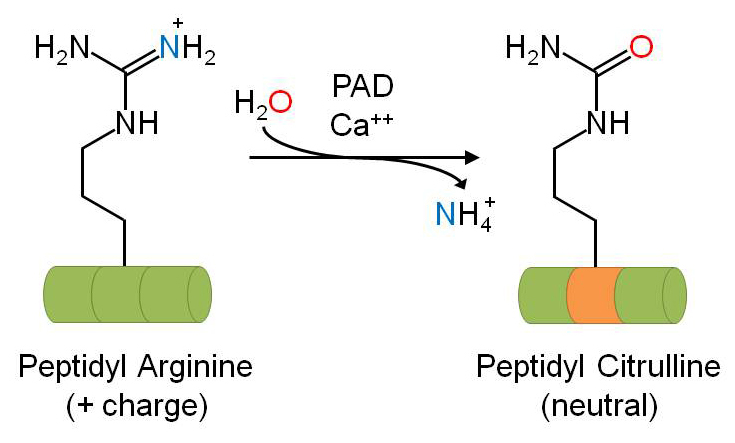 Peptidylarginine deiminases (PADs) mediate the calcium-dependent deimination of the guanidino group of arginine side chains to form an ureido group and the nonstandard amino acid citrulline (see Fig. 1). There are 5 different PAD isoforms (PAD1-4, PAD6) that share significant sequence homology and differ primarily in their tissue-specific expression1. PADs are incapable of deiminating free L-arginine, which confirms their primary role in the modification of arginine side chains present in proteins2. To date, there have been no enzymes identified that can reverse this process. The deimination of arginine side chains in proteins results in the net loss of a positive charge and an increase in local hydrophobicity for the target protein. The biochemical implications of protein citrullination include protein unfolding3, loss of protein : protein interactions and/or interactions with other cellular components4, interference with other signaling events (e.g., arginine methylation5,6), and the unveiling of novel antigenic epitopes that can elicit immune responses and autoimmunity7. Although the consequences of citrullination appear to negatively impact protein function, it is important to realize that this is a physiologically important process. Citrullinated proteins play essential roles in differentiation, nerve growth, embryonic development, cell death, and gene regulation8. Some biologically-relevant proteins known to be citrullinated by PADs include keratin, filaggrin, trichohyalin, vimentin, myelin basic protein (MBP), histones, alpha-enolase, fibrinogen, fibrins, collagen type I and II, beta-actin, and tubulin9-11. It is noteworthy that several of these proteins are part of the cytoskeleton and/or are structural in nature. Pathological protein citrullination has been associated with a range of diseases including multiple sclerosis, Alzheimer’s disease, rheumatoid arthritis (RA), psoriasis, prion disease, liver fibrosis, chronic obstructive pulmonary disease (COPD), and cancers8,12,13. The fact that most, if not all, of these diseases have an inflammatory component to their pathology is consistent with the importance of PADs in inflammation14. In the case of RA, several proteins have been identified that are specifically citrullinated in the synovial fluid of arthritic joints10; many of which are mentioned above. The citrullination of these proteins results in novel epitopes that give rise to autoantibodies7, and the resulting anti-citrullinated protein antibodies (ACPAs) have become a standard diagnostic and prognostic indicator for RA15-17. Circulating ACPAs are often present before other symptoms of RA and they are associated with an earlier onset of the disease, more severe joint damage, and a higher risk of cardiovascular co-morbidities15-17. Figure 1: SCitrullination of peptidyl-arginine by peptidylarginine deiminases (PADs). Vimentin is an intermediate filament (IF) protein that is among the milieu of citrullinated proteins that are associated with RA18. The vimentin cytoskeleton is essential for maintaining cell and tissue integrity, cell adhesion/migration, and many cell signaling events19. Importantly, citrullinated vimentin is not an innocent bystander in the immune response within the synovial fluid of RA patients, but appears to be critical for triggering the production of ACPAs20. Moreover, the autoantibodies generated to citrullinated vimentin have been shown to directly induce bone loss through osteoclastogenesis21. The citrullination of vimentin is thought to be mediated by PAD2 and results in a loss of vimentin’s normal function, leading to filament instability, inability to polymerize in vitro, and the collapse of the vimentin cytoskeleton in cells4,22. Conversely, citrullinated vimentin has also been shown to have an active role in the apoptosis induced by PAD2 in activated T lymphocytes23. Substantial immune cell apoptosis occurs in the synovial fluid of RA patients and further research is needed to understand if apoptosis is the primary mechanism by which the normally intracellular vimentin becomes extracellular and is able to elicit an autoimmune response. Importantly, first and second generation PAD inhibitors have shown promise in preclinical studies with animal models of diseases where protein citrullination is known to be important24. It will be exciting to witness the maturation of PAD inhibitors over the next several years and see the development of inhibitors that have the potency, selectivity, and pharmacological properties needed to progress into human clinical trials. E.R. Vossenaar et al. 2003. 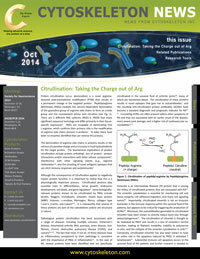 PAD, a growing family of citrullinating enzymes: genes, features and involvement in disease. Bioessays. 25, 1106-1118. H. Takahara et al. 1986. Calcium-dependent properties of peptidylarginine deiminase from rabbit skeletal muscle. Agric. Biol. Chem. 50, 2899-2904. E. Tarcsa et al. 1996. Protein unfolding by peptidylarginine deiminase. Substrate specificity and structural relationships of the natural substrates trichohyalin and filaggrin. J. Biol. Chem. 271, 30709-30716. M. Inagaki et al. 1989. Ca2+-dependent deimination-induced disassembly of intermediate filaments involves specific modification of the amino-terminal head domain. J. Biol. Chem. 264, 18119-18127. Y. Wang et al. 2004. Human PAD4 regulates histone arginine methylation levels via demethylimination. Science. 306, 279-283. G.L. Cuthbert et al. 2004. Histone deimination antagonizes arginine methylation. Cell. 118, 545-553. G.A. Schellekens et al. 1998. Citrulline is an essential constituent of antigenic determinants recognized by rheumatoid arthritis-specific autoantibodies. J. Clin. Invest. 101, 273-281.Z. Baka et al. 2012. Citrullination under physiological and pathological conditions. Joint Bone Spine. 79, 431-436. K. Conrad et al. 2010. Profiling of rheumatoid arthritis associated autoantibodies. Autoimmun. Rev. 9, 431-435. J.J. van Beers et al. 2013. The rheumatoid arthritis synovial fluid citrullinome reveals novel citrullinated epitopes in apolipoprotein E, myeloid nuclear differentiation antigen, and β-actin. Arthritis Rheum. 65, 69-80. Z. Jiang et al. 2013. Investigating citrullinated proteins in tumour cell lines. World J. Surg. Oncol. 11, 260. S. Abdeen et al. 2011. Serum anti-modified citrullinated vimentin antibody concentration is associated with liver fibrosis in patients with chronic hepatitis. Hepat Med. 3, 13-18. B. Jang et al. 2013. Peptidylarginine deiminase and protein citrullination in prion diseases: strong evidence of neurodegeneration. Prion. 7, 42-46. D. Makrygiannakis et al. 2006. Citrullination is an inflammation-dependent process. Ann. Rheum. Dis. 65, 1219-1222. W.J. van Venrooij et al. 2002. Anticitrullinated protein/peptide antibody and its role in the diagnosis and prognosis of early rheumatoid arthritis. Neth. J. Med. 60, 383-388. E.J. Kroot et al. 2000. The prognostic value of anti-cyclic citrullinated peptide antibody in patients with recent-onset rheumatoid arthritis. Arthritis Rheum. 43, 1831-1835. O. Meyer et al. 2003. Anticitrullinated protein/peptide antibody assays in early rheumatoid arthritis for predicting five year radiographic damage. Ann. Rheum. Dis. 62, 120-126. E.R. Vossenaar et al. 2004. Rheumatoid arthritis specific anti-Sa antibodies target citrullinated vimentin. Arthritis Res. Ther. 6, R142-R150. J. Ivaska et al. 2007. Novel functions of vimentin in cell adhesion, migration, and signaling. Exp. Cell Res. 313, 2050-2062. K. Van Steendam et al. 2011. The relevance of citrullinated vimentin in the production of antibodies against citrullinated proteins and the pathogenesis of rheumatoid arthritis. Rheumatology. 50, 830-837. U. Harre et al. 2012. Induction of osteoclastogenesis and bone loss by human autoantibodies against citrullinated vimentin. J. Clin. Invest. 122, 1791-1802. I. Hojo-Nakashima et al. 2009. Dynamic expression of peptidylarginine deiminase 2 in human monocytic leukaemia THP-1 cells during macrophage differentiation. J. Biochem. 146, 471-479. P.C. Hsu et al. 2014. Vimentin is involved in peptidylarginine deiminase 2-induced apoptosis of activated Jurkat cells. Mol. Cells. 37, 426-434. K.L. Bicker and P.R. Thompson. 2013. The protein arginine deiminases: Structure, function, inhibition, and disease. Biopolymers. 99, 155-163.